Wiring allows you to control the growth of your maturing tree. Wires are wrapped around the developing trunk and branches to guide their growth into the desired shape. Wiring can begin once the roots of the tree have been established and the trunk is beginning to grow. It is an ongoing process that is done in stages and with multiple branches. Wiring benefits the developing tree in two ways. Wiring serves a practical function, since the tree will not grow into the desired form on its own. Wiring allows you to guide the growth, even in sometimes inherently unnatural ways such as the shakan slanting form. This also benefits the tree aesthetically. While the wiring allows you to control the basic form, it also allows you artistic license to make the bonsai uniquely beautiful in ways that would not be available through natural growth and pruning. Bonsai wiring is typically done with either copper or aluminum wire. The wire chosen should be approximately 1/3 the diameter of the branch or trunk being wired. Both types of wire have benefits and drawbacks, so take that into consideration before choosing a wire. Copper wire is stronger than aluminum and, because of that, holds its form and stays in place better than aluminum. Because of that, it can damage the branches and trunk if not carefully monitored for bruising or cutting into the plant. If you use copper wire, you should monitor the growth and condition of the wired parts weekly. Since the potential for damage is greater with copper wire than aluminum, it is less forgiving for a novice bonsai owner and should be used with caution. Aluminum wire is easier to move and manipulate. Because of that easy flexibility, though, it is not as sturdy as copper wire. It is more forgiving for a novice, though, and does not require monitoring as often as copper wire. Aluminum only needs to be monitored every two weeks. Both beginners and seasoned bonsai artists may prefer aluminum wire because of the greater ease of use compared to copper. Both wires will accomplish good results. Regardless of wire type chosen, careful observation of the tree and good wiring techniques are necessary. Wiring needs to be done to a young, healthy plant to provide the desired results. 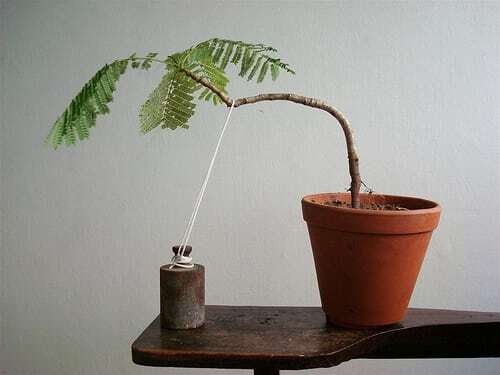 Wiring is typically performed when the plant has been repotted to offer support for the new growth. Choosing the right time also depends on the type of plant. Proper time to wire differs between deciduous and coniferous trees. Deciduous trees are wired in the early spring. This needs to be timed before new budding begins on the limbs. Wiring at this time gives you the best visualization of the trunk and branches before the leaves and new growth emerges. You can see the limbs clearly and apply the wiring without new leaves and branches getting in the way. Coniferous trees are wired in the late autumn or early winter. Because coniferous trees cyclically renew their foliage annually, the limbs are always populated with a certain amount of foliage. So, unlike deciduous trees, bare limbs are not a consideration. Rather, wiring is performed when the sap is lowest in the branches. The branches are more flexible and respond better to wiring when the sap is low. Avoid wiring a plant that is unhealthy. Likewise, do not wire weak branches. Spend some time nourishing the plant and improving its vitality before wiring. Also avoid wiring a plant that is freshly watered. The limbs are most flexible when they are moderately dehydrated. Poor flexibility of the limbs increases the likelihood of limb damage or breakage. Wiring requires a healthy, young plant and a proper choice of wire. From there, wiring requires a patient, deliberate application of the wire. Take your time, and be very careful about supporting the plant throughout the process. As you apply the wire, hold the limb in both hands and remember to bend the wire to the branch and not the other way around. When wiring, begin with the trunk and then progress from the thickest branches to the thinnest. Bend the wire up the trunk and outwards on the branches, from the trunk to the tip. Position yourself so that you are wiring towards yourself. This will give you the maximum control and allow you to evenly wrap the wire. The wire should be wrapped around the limbs at a 45 degree angle in a “barber pole” fashion. The wire should form to the limb and guide its direction, but it should not be overly tight. Remember that your plant is growing and needs space for its increasing size. The wires will be guiding growth in unnatural directions, too. The plant will want to continue to grow to its original direction at first, and if the wire is too tight, it will cut into the plant. Precise but loosely wrapped limbs will help avoid these problems. Anchoring will provide stability and prevent crossed wires or excess tension on individual limbs. The trunk’s wire should begin with a firm foundation in the soil. It should feel steady with a moderate amount of wiggling. Once steadied, the trunk can be wired. Begin at a tight angle as the wire emerges from the ground, and then sustain the wiring at a 45 degree angle. Branches are anchored by winding the end of the wire closest to the trunk around the wire supporting the trunk. The 45 degree angle guideline for wrapping the wire can be adjusted if the limb has a sharp bend in it. Wind the wire at a smaller angle as you work past the turn. This will provide the additional support needed to straighten the bend. You can use the same continuous piece of wire on two branches if they are both of the same thickness. Anchor the wire around the trunk to secure and balance the wiring. Do not attempt with branches of markedly different thicknesses. Use separate wires for each. If dealing with a particularly strong branch, you can use two or three wires winded together and for extra strength and support. The wire can be removed when it has achieved its purpose and helped the trunk or branch grow in the desired direction. Wire should also be removed if it begins to grow into the plant. Gently cut off the wire with wire cutters. Do not attempt to unwind the wire from the limb or reuse wire. Attempting this can damage the plant and even break the branch. Wire is plentiful and easily replaced. Your bonsai is not.